As the Monster Energy NASCAR Cup Series heads to Indianapolis for the final race before the playoffs, what strategies should we know before filling out our lineups for NASCAR DFS? This week, the Monster Energy NASCAR Cup Series is heading to Indianapolis for their crack at one of the most historic venues in sports. It's also a spot that presents some unique challenges for daily fantasy NASCAR. What should we know before filling out lineups for the Big Machine Vodka 400 at the Brickyard? Let's check it out. As you likely know, there aren't many stops -- if any -- more iconic to auto racing than Indianapolis Motor Speedway. Being the site of the Indianapolis 500 gives the track an air of classiness and respect that translates when the stock cars come over, as well. That doesn't mean they won't get a little wild, though. Last year's race was a demolition derby with only 21 of 40 cars finishing the race. That's not necessarily the norm here, but this track can get a little weird despite its reputation. It's possible that calamity could carry over into the 2018 version, as well. 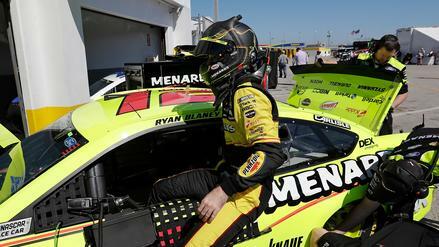 The race is now the final one before the playoffs, meaning it's desperation time for drivers like Ricky Stenhouse Jr., Paul Menard, Ryan Newman, and Daniel Suarez, who all need to win in order to qualify for the 16-driver postseason. This is significant for DFS. 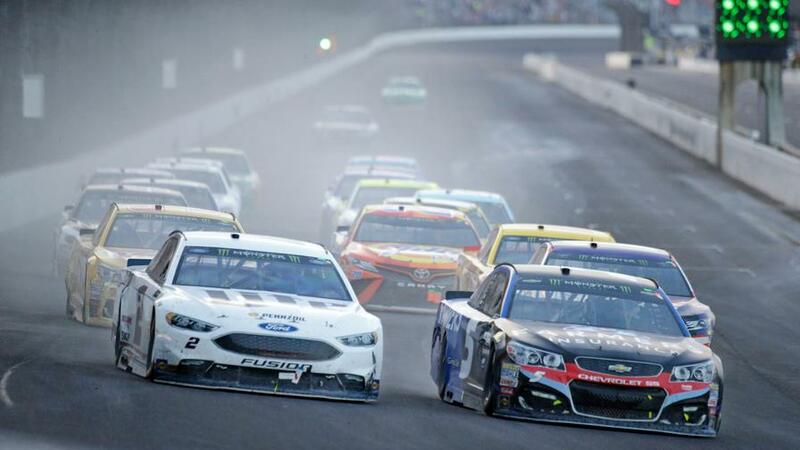 If a race features more crashes -- leading to extra variance -- it can be beneficial to target drivers starting further back in the pack, hoping they work their way forward to rack up place-differential points. As mentioned, though, that race was a bit of an outlier for the track. Just five cars crashed out in 2016, and it was one the year prior. So, how are we supposed to view this track? We can get some assistance in this pursuit by looking at the number of laps in the race. Because it's a 160-lap event, there are just 16 points available for laps led on FanDuel. This is another trait that will push us toward using a good number of drivers starting outside the top 10 as drivers at the front will possess less upside than usual. 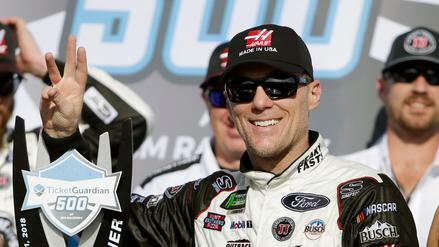 In the past four Indianapolis races, only one driver has led more than 100 laps in a race. 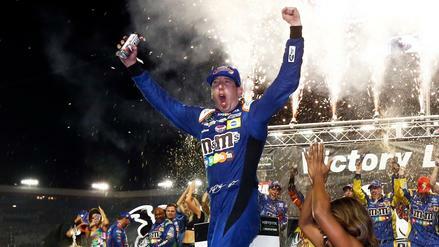 That was Kyle Busch in 2016 when he led a whopping 149 circuits and won in dominant fashion. Outside of that, only 3 drivers have topped the 40-laps-led barrier, and only 5 have led more than 30. Outside of maybe one dominator per race, you're not getting a ton of points from laps led. Another thing that pushes us toward the back is that drivers can finish better than they start here. Indianapolis is certainly not an easy track for passing, and track position is key, but you don't have to start up front to finish well there. 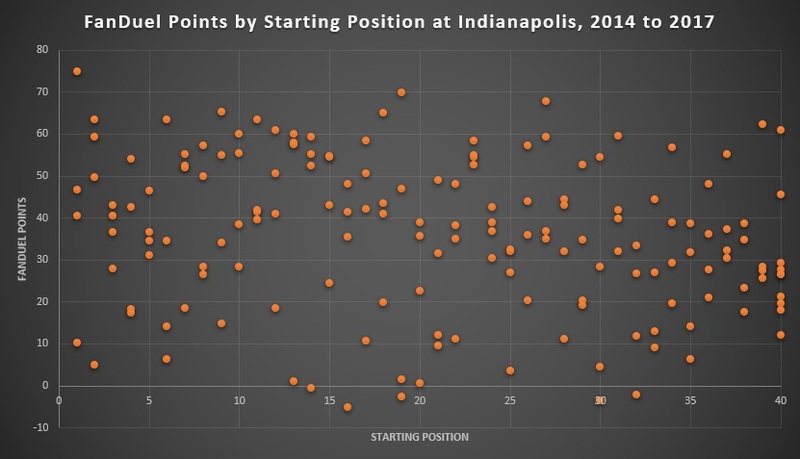 The table below shows where the top-10 and top-5 finishers have started over the past four Indianapolis races. In this time, more drivers starting 11th to 15th finished in the top 10 than any other starting range. You can use some strategy to make up spots here, meaning place-differential points will absolutely come into play. These two threads -- the lack of laps to be led and the ability to make up ground -- combine to make it seem like we'd want to favor drivers starting a bit further back. But how many drivers should we roster starting near the front, and how far back should we go? Let's dig in a bit more to get a clear thought process for Sunday's race. To start things off, let's just get the broad picture of what scoring looks like at the track. To do that, we're going to look back at the past four Indy races. This means we'll be dipping back to the 2014 and 2015 seasons, in which the maximum number of cars in a race was 43 instead of the current 40. To compensate for this and make things fit with FanDuel's scoring rules, any driver starting or finishing worse than 40th has had their spot adjusted to be exactly 40th. Once that adjustment is done, here's the FanDuel-point output for each driver in this span based on their starting spot. That dot in the upper left-hand corner is Busch in that dominant 2016 running. But after that, the high-upside races are pretty spread out. In total, 13 drivers have scored at least 60 FanDuel points in this time. Only two of them started the race in the top five, and only three others started in the top 10. There were more drivers starting outside the top 25 -- three -- to hit this mark than there were in the top five. Unless you dominate, your best shot at upside is coming from deeper in the pack. If we lower the threshold to 55 FanDuel points, you can see that the starting spot for drivers to hit that mark spans all the way through the pack. In looking at that table, you'll notice that there's a big grouping of drivers starting 11th to 15th who grade out well in races. Based on this, they seem to have a respectable floor, which is desirable. They also seem to have a great ceiling. Here's a look at the starting positions of the five highest-scoring drivers in each of the past four races. The "1st" column shows the starting spot of the highest-scoring driver in that race and so forth. Six of the 20 drivers in that table started between 11th and 15th, and 2 others started 10th. More than half the drivers started between 9th and 19th. This isn't hard to explain anecdotally. Drivers starting in the top five lack upside unless they happen to be the one driver who leads a ton of laps. Drivers starting deep in the pack -- for the most part -- aren't going to finish high enough to post a huge score. But the drivers in that second tier are in prime position to put up points. Not only are they starting high enough to push for a win or a top-five finish, but they can also pick up at least a few place-differential points in the process. That's valuable in a race with a limited number of laps to be led. If a strong race car starts in this range from around 10th through 19th, we should have a good amount of confidence in plugging them into our rosters. That range has historically performed well, and we can easily explain why. With that being said, we should not completely ignore the upper range. In last year's race, not a single driver starting in the top 10 was among the five highest-scoring drivers. But that's largely because Busch and Martin Truex Jr. -- who had combined to lead 99 of the first 110 laps -- wrecked each other with 50 laps to go. In each of the other three races, there was at least one driver who started on the front row among the top five in scoring. As such, for most lineups, we should pick a driver starting near the front who we think is capable of leading a bunch of laps. They don't have to necessarily start first or second, but those positions have been the most likely to lead significant laps in the past here. After that, it seems wise to pepper that 10th through 19th range, plucking drivers starting there who have a chance to push for a top-five finish. This has been a dominant tier in the past, and we shouldn't expect that to change this weekend. Finally, if a strong car does wind up starting in the back, we should feel good about using them. Denny Hamlin finished 3rd after starting 27th in 2014, and A.J. Allmendinger moved up to 10th from 39th last year. With the ability to make up ground via strategy at this track, a strong car in the back will be one of the better plays of the weekend. Before closing up shop, it's worth mentioning that we should be wary of "punting" this weekend and using super cheap drivers in poor equipment. Last year, it did pay to punt. Drivers who would have been cheap that weekend like Matt DiBenedetto, Chris Buescher, Danica Patrick, Cole Whitt, and Timmy Hill all finished 14th or better in that race. But remember, that one featured a ton of crashes, and that has not happened often historically at the track. You don't have to avoid punting altogether, but you should at least limit the number of lineups in which you do so.